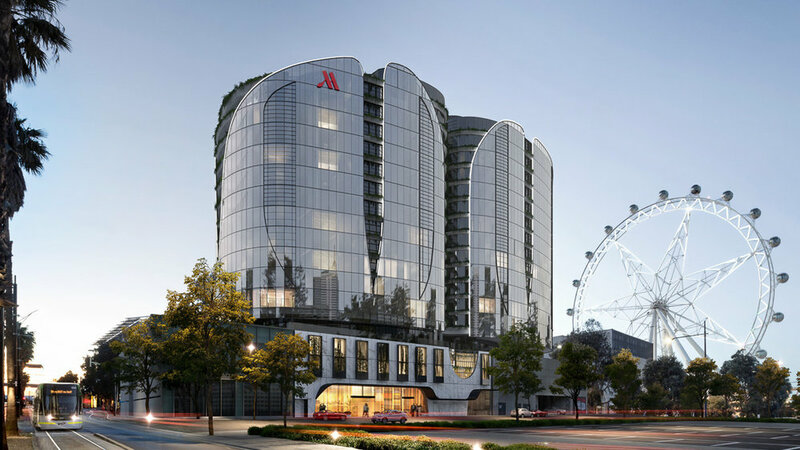 Capital Alliance is pleased to be developing the first purpose-built Marriott in Australia in more than 20 years, ushering in a new era of modern hospitality. 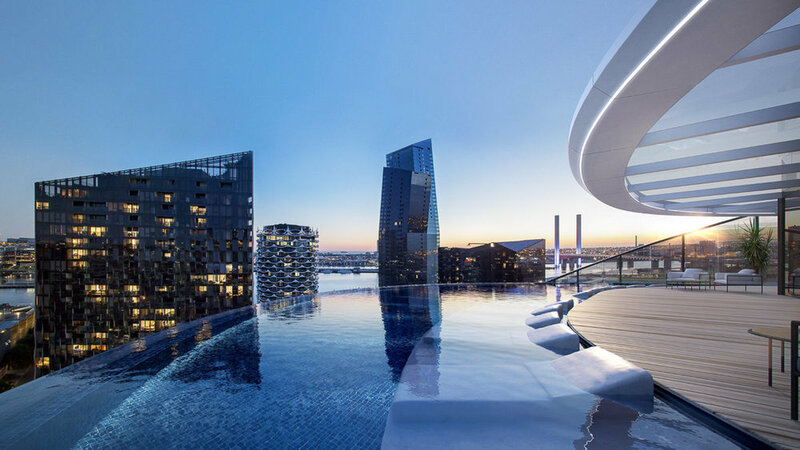 Designed by award-winning DKO Architecture, a Marriott hotel will be part of the mixeduse development that includes The Docklands Residences, and will include restaurants, a rooftop infinity pool and bar, executive facilities and state-of-the-art function spaces. Sleek, sculptural, sophisticated. The architecture of The Docklands by DKO Architecture presents a new landmark of luxury living inspired by the timeless style of the city at its door. Taking cues from the aerodynamic contours of yachts moored around Docklands, DKO has envisioned a building of graceful curves. A translucent screen wraps around the building, providing wintergardens enclosed in glass, with the curved façade providing multiple and enviable aspects of the water, the city and the Bolte Bridge. Stepping into the lobby, the grandeur of architecture seamlessly continues within. On the floors above, the design the of the building has created a limited number of residences per floor, providing a rare sense of privacy and exclusivity. From the dedicated residential lobby, a private elevator takes you to your home high above – one of a limited collection of over-sized residences. These residences are offered in two distinctive designs, each with a signature sense of style: The Melbourne Collection and The Docklands Collection. While the designs offer varied tones, textures, floorplans and features, all residences share an approach to liveability as natural and discerning as Melbourne itself. These are beautifully appointed homes inspired by the city’s love of entertaining and an appreciation for smart design. 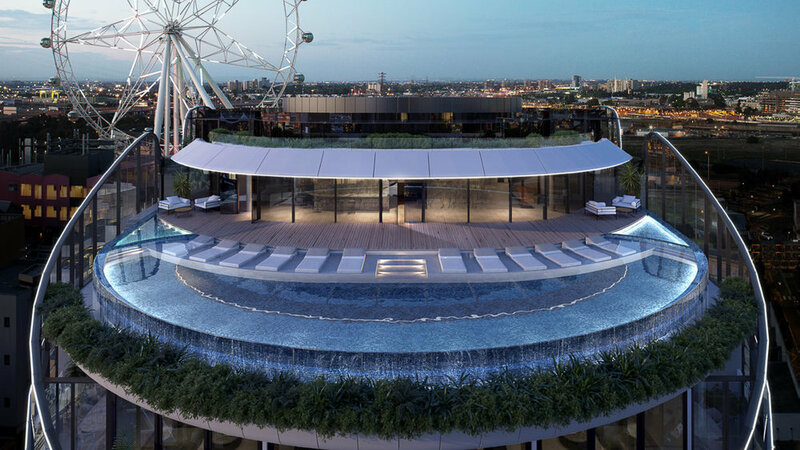 Meticulously crafted with superior finishes, awash with natural light through floor-to-ceiling windows, featuring a private balcony or winter garden, and offering exceptional water and city views, The Docklands Residences is a premium address for a premier location. The Melbourne Collection encompasses the very essence of refined urbanity. Inspired by the cool tones and afterhours life of the city, this is the perfect place to come home to at the end of a Melbourne day. Upon entering, the evocative colour palette reveals itself in darker tones which have been inspired by Melbourne’s traditional use of bluestone. Metallic joinery and timber flooring provide polished accents in the design, while the large living spaces enjoy abundant natural light streaming in through floor-to-ceiling windows. design continues with highend Gaggenau appliances, a dedicated appliance cupboard and a cooktop on the island bench making this space a pleasure to share. With its feature marble, the bench becomes a natural entertainment hub, much as Melbourne’s best restaurants offer seating at a kitchen bar. The scene is set for your next exclusive event, with exceptional views to match. Inspired by the city’s cultural heart and social scene, The Docklands Collection presents a home to be enjoyed with family and friends. With a range of textured and lighter tones, this design is about warmth and welcome. Designed for the discerning entertainer, The Docklands Collection has been meticulously crafted from every angle, while still providing ample opportunity for residents to inject their own sense of style across the generous spaces. Unlike its counterpart in The Melbourne Collection, in this kitchen a curated selection of the residents’ wares is on display. High-end Gaggenau appliances allow for effortless entertaining, and a builtin wine fridge in the three-bedroom residences ensures a personal reserve is always kept at the optimum temperature. A built-in desk, with the option to close this area off when guests visit, is yet another design feature which sets this collection apart. The Docklands Collection features a warm colour palette, with natural tones and elegant timber flooring, all highlighted by sunlight streaming into each home through the floor-to-ceiling windows.